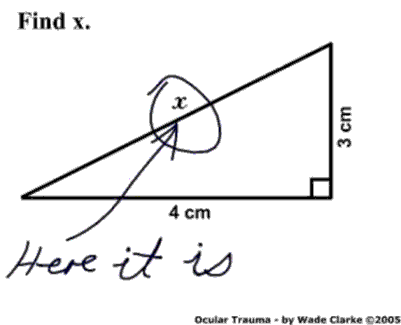 What is Mean Value Theorem? 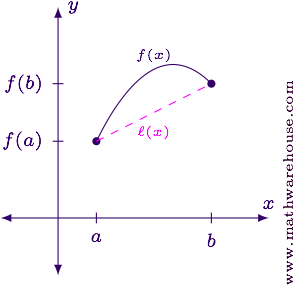 The Mean Value Theorem is typically abbreviated MVT. The MVT describes a relationship between average rate of change and instantaneous rate of change. 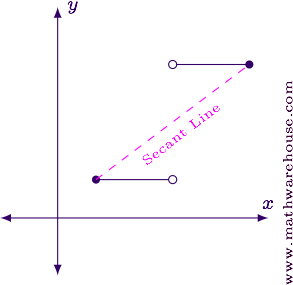 Geometrically, the MVT describes a relationship between the slope of a secant line and the slope of the tangent line. Rolle's Theorem (from the previous lesson) is a special case of the Mean Value Theorem. In order for this to be true, the function has to be continuous and differentiable on the interval. 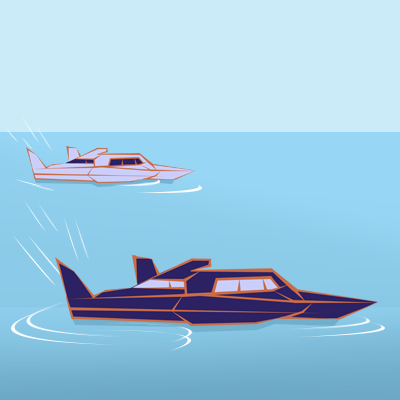 Suppose two boats travel the same distance in the same amount of time (perhaps they tie in a race). Also, suppose the first boat drove at a constant speed for the entire trip. What do we know about the speed of the second boat during the trip? Did the second boat have to have a constant speed for the whole trip? No. It could have driven faster for a while and slower for a while. Or vice versa. Could the second boat have driven faster than the first boat the entire time? No. If it had, it would have made the trip in less time. Could the second boat have driven slower than the first boat the entire time? No. If it had, it would have taken longer to make the trip. Conclusion: The second boat's speed had to be the same as the first boat's at least once during the trip. This is exactly the idea of the Mean Value Theorem. As shown in the graph below, a discontinuous function could have tangent lines that aren't parallel to the secant line anywhere on the interval (the tangent lines have a slope of $$m=0$$ since the function consists of horizontal line segments). 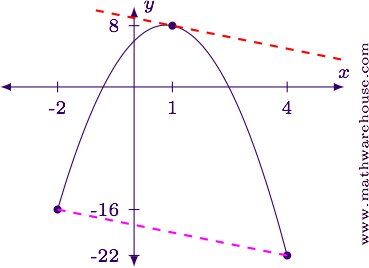 The graph below shows what can happen if a continuous function is not differentiable over the interval. 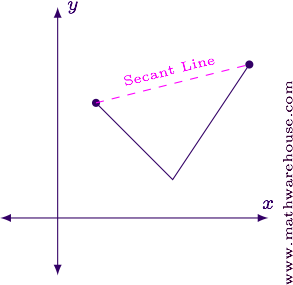 Notice that the slope of the tangent lines are not parallel to the slope of the secant line anywhere on the interval (the slopes of the tangent lines are constant, but not equal to the slope of the secant line). 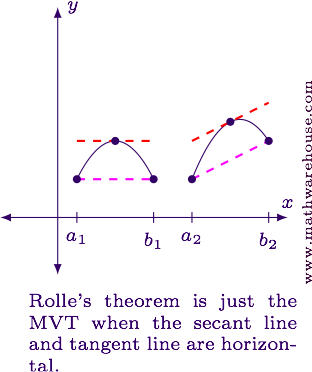 Graphically, you can see that Rolle's Theorem is just a special case of the MVT. Suppose $$f(x) = x^3 - 2x^2-3x-6$$ over $$[-1, 4]$$. What value of $$x$$ satisfies the the Mean Value Theorem? 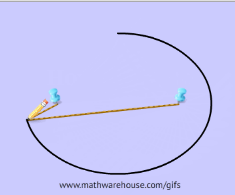 Find the slope of the secant line. Determine where $$f'(x)$$ is equal to the slope found in step 1. 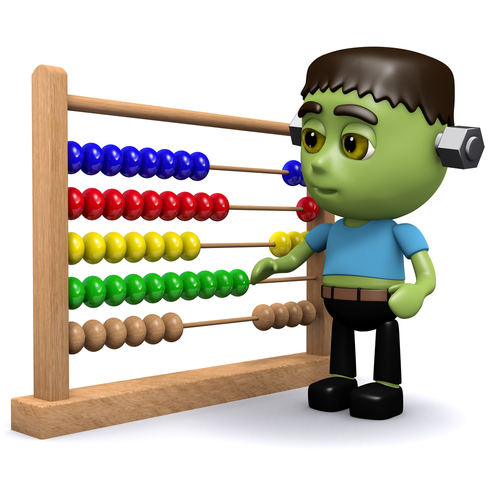 The MVT guarantees that $$c\in(a,b)$$, and since $$\frac 7 3 \in (-1,4)$$ this is the value we are looking for. Note, the $$x = -1$$ is excluded since $$-1 \not \in (-1,4)$$. $$x = \frac 7 3$$ satisfies the MVT. 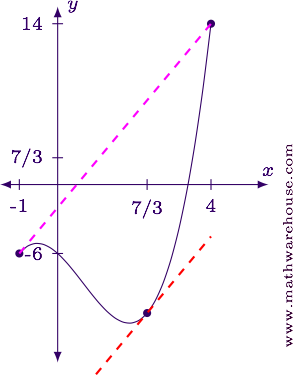 For reference, below is the graph of the function with one of the tangent lines and the secant line. 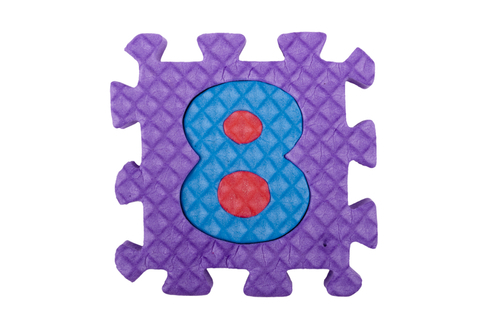 Suppose $$f(x) = 6+5x-3x^2$$ over $$[-2,b]$$. Find the value of $$b$$ so that the Mean Value Theorem is satisfied at $$x = 1$$. Find the slope of the secant line connecting the endpoints of the interval. Determine the value(s) of $$b$$ where the value of the slope found in step 2 is equal to the derivative value found in step 1. We already know the left-hand value of the interval is $$x=-2$$, so the right-hand value is $$x = 4$$. 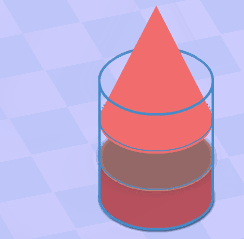 We can use the interval $$\displaystyle \left[-2, 4\right]$$. For reference, below is the graph of the function, the secant line and the tangent line at $$x=1$$. 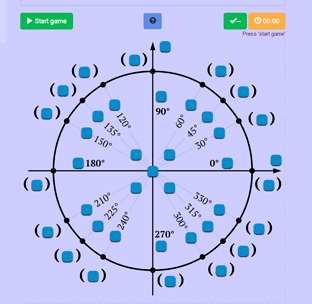 Let's use $$f(x)$$ to represent the function and $$\ell(x)$$ to represent the secant line connecting the endpoints. The equation in the MVT says the slope of the tangent line is equal to the slope of the secant line. The slope of the tangent line is $$f'(c)$$ and the slope of the secant line is $$\ell'(c)$$. Continuity: We know $$f(x)$$ is continuous (by assumption) and $$\ell(x)$$ is continuous since it is just a linear function. Therefore, $$h(x)$$ is continuous since it is the difference between two continuous functions. Differentiability: Likewise, both $$f(x)$$ and $$\ell(x)$$ are differentiable, so $$h(x)$$) is too. Finally, $$h(a) = f(a) - \ell(a) = 0$$ and $$h(b) = f(b)-\ell(b) = 0$$ so $$h(a) = h(b)$$. Start with a function,$$f(x)$$, that is continuous and differentiable over the interval. Define two new functions: $$\ell(x)$$ is the equation of the secant line and $$h(x) = f(x) - \ell(x)$$. Note that $$h(x)$$ meets the conditions for Rolle's Theorem. That means $$h'(c) = 0$$ for some $$c\in[a,b]$$. We know $$h'(c) = f'(c) - \ell'(c)$$. Many students see the MVT as a trivial curiosity, but to the mathematician it plays a vital role in establishing the truths in calculus. Here is a quote from two important mathematicians who understood this difference of viewpoints. In our next lesson we'll examine some consequences of the Mean Value Theorem. back to What is Rolle's Theorem? 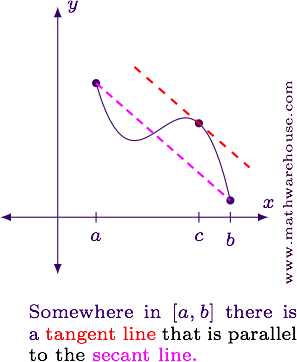 next to What are Some Consequences of the Mean Value Theorem?